Dear Songwriters: Please Learn This! Okay, I’m going to make people mad with this post because I’m writing about music. You see some little numbers in bold, and under those numbers are some tune names. Those little numbers show how many syllables comfortably fit the meter of a tune. day takes leave of night. Judging from most of the contemporary worship music produced these days, I figure writing lyrics that fit a meter is either passé, or people just plain don’t know what a meter is. The very first lines convey information about the rest of the song, and listeners can immediately predict the pattern of the verse: 9-4, 9-4. This makes it easy to sing along, clap, gyrate your booty, or whatever you do when you hear such stuff. Nearly every syllable has it’s own note in every phrase. Now, as much as I like the song “Jeremy,” there is no way to sing along with it the first time you hear it. You cannot predict where the syllables are going to hit the notes, if they hit at all. Rhyme, which also helps people predict how to sing, is totally absent in this song. Again, I like this song, but it isn’t singable on a first (or second, or third) hearing. You wouldn’t actually use this song in worship, but it would be nearly impossible to do so for the simple fact that the lyrics are unpredictable. U2, a band a lot of contemporary musicians try to emulate, also sing a lot of irregular lyrics. Now, if you listen to the words often enough and memorize them, you may be able to sing along with them, but if you try to get a group of diverse people who have never heard the lyrics before to sing along, you are pretty well guaranteed to fail. I’ve heard artsy-fartsy songwriters criticize metrical tunes as being too “singsongy.” YES!!!!! Exactly! Singsongy predictability is what you need if you want a group of people to sing along. Using an irregular meter says to visitors, “You need to be a regular attender, an insider, to know and understand this music. Maybe you’ll be able to sing along after you’ve been coming for a few weeks.” No, thanks. The ironic thing is that I’ve heard worship musicians say that the above songs are too much like performances. When I’ve said that worship music should be more like Ben Harper and Lenny Kravitz and less Bono, they make the same comments. Really? Who is easier to sing along with? Not only are the lyrics complex, there are just too dang many syllables in each line. Again, I want to point out that I like the song just fine, I just think it’s lousy as a congregational song. It may have a place in worship as a special musical offering or a solo. Here is a song that I really like. It has great lyrics, consistent imagery, and is just plain beautiful. But if you’ve never heard it before, try to figure out where to sing, even if lyrics were projected in front of you. Again, I will say that I like this song. It is just not a good congregational song. This is where many music leaders object that if you hear it enough, you can sing with it, but that’s like saying an auditorium full of 20,000 Pearl Jam fans can sing along to Jeremy. People often talk about the distinction between “worship” and “performance,” and they can get into all sorts of abstract arguments about it, most of them dealing with the subjective emotional experience of the individual. But when you worship you are dealing with a community, and the more relevant questions are things like, “What enables this body to act as one in praising its creator?” I think it’s primal stuff: bread, wine, water. Rhythm, call, response, melody, harmony. I wish more contemporary songwriters understood this. One more thing with regard to meters: My pet peeve is the song “Hungry.” This song has a meter, but the syllables hit the notes in odd places. Je-SUS you’re all my heart is longing for. As a friend of mine from high school used to say, your emPHAsis is on the wrong sylLABle. It drives me nuts that we have such a rich musical heritage in Birmingham churches, black and white, high church and low, mainline and independent, secular and sacred—and we keep singing stuff like this. It’s not that I don’t like songs by Chris Tomlin and David Crowder, it’s just that as a pastor and worship leader it’s my job to help a community work, pray, and sing together. It’s hard to do that with lyrics that are not easily singable. I went to Innerchange UMC last Sunday (which I will talk about in my next post), and I loved the fact that they write a lot of their own music. The last song they sang was instantly singable and it had lyrics relevant to their own community. I would love to have such music in our new church. I dove into the pavement Saturday around 6:30 AM. I was half way through a four-mile run when I took the opportunity to glance at my map on my phone to see how far I had gone. The toe of my left shoe never saw the edge of the pothole. The abrasions didn’t bleed so much as ooze, so I was able to contain most of the drippage in the car. By the time we got home my ankle was about the size of a baseball. It wasn’t bruising, so I suspected it was a sprain instead of a break, but we decided to go to the ER anyway to check it out. We were out by lunchtime and they had given me something for pain that made me pretty woozy. So I have to keep weight off of it for a while and have been hobbling around on crutches. Yes, I know this is Judo, but you know what’s about to happen. They taught us how to fall well when I took Tae Kwon Do. The thing about falling is that it’s most dangerous when you don’t expect it. 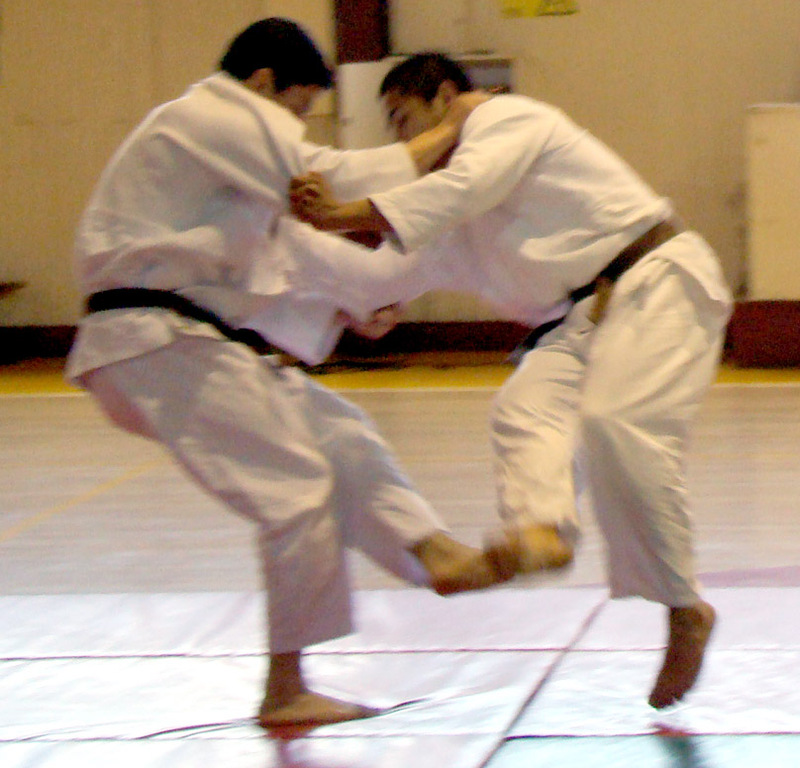 When you are sparring or playing contact sports, you expect to fall. What I did was the equivalent of texting while driving. My brain was elsewhere. There are probably all sorts of metaphors and learning experiences I could take away from this experience, either about life or about planting a church in Birmingham. I do have a tendency to get caught up in big-picture abstractions, and little details (like a piece of cracked asphalt) can trip you up. Falling is easier when you expect it. Things like that. Those are all good lessons. But the most concrete, practical lesson I would like to convey to everyone I know is this: DO NOT TEXT AND DRIVE. Heck, don’t text and walk. Seriously. I was just running when I glanced at my phone. I was not in a one-ton chunk of steel hurtling along at 60+ miles per hour. This crap happens to you when you least expect it. That’s why they call it an accident. If you meant to wreck I suppose they’d call it an on purpose. I’m usually pretty good about not attending my phone while I’m in the car, but I have gotten more slack over recent months. No more. I’m glad I hit a pothole while running instead of a person while driving. If it took this trip to make an impact on me (literally and figuratively), I figure it was a good lesson. And even if I didn’t fall gracefully this time, if I learned a practical lesson, then I fell well. Good snapshot of Methodist soteriology (the theology of salvation). All need to be saved. All can know themselves to be saved. All can be saved to the uttermost. 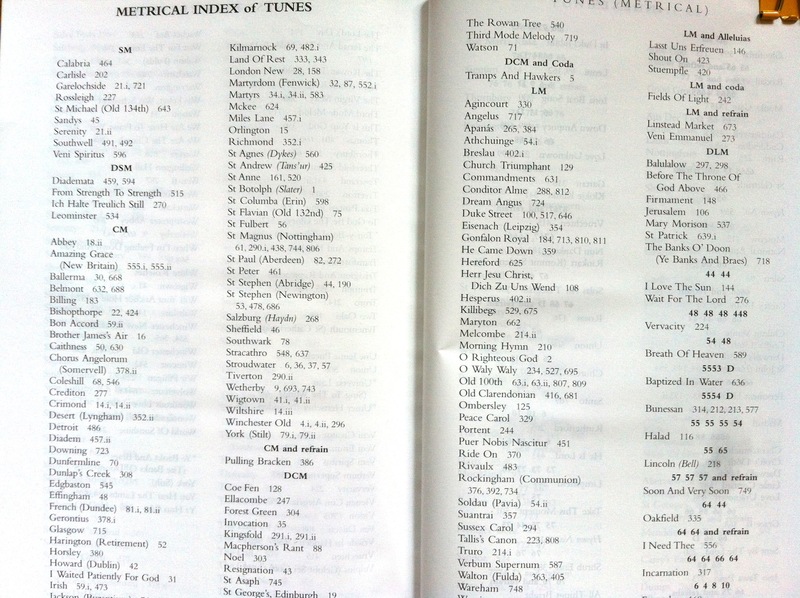 In the early 20th century, a writer summarized the Four Alls of Methodism listed above. I don’t recall when I was first exposed to them, but to this day when I hear people say “all means all,” I have to remind myself that they are not referring to this list. For me, these four Alls still are the best short hand for the heart of Methodism. One of the things I’ve been looking forward to is the time I’ve scheduled this summer to visit other churches and learn from them. I visited a major Birmingham mega-church this past Sunday, and although I did not get to hear the senior pastor preach, I did get to observe what happens in worship. I’ll go ahead and confess I’m inclined to be annoyed at this large, dynamic, successful church. Part of my annoyance is healthy competitive spirit, but it is part envy as well. I have been in ministry in other cities and other churches dwarfed by a large neighboring church, stymied by attempts to do ministry because “______ Church is already doing that far better than we can.” Rather than being excited by the other church’s positive impact in a community, I’ve been resentful. Members would get siphoned away from our church to the larger one because of bigger youth and children’s programs, and I would mutter about “sheep-stealing.” (To be fair, I’ve also been in ministry in a large, dynamic church that has probably done the same to smaller neighbor churches as well). So when the preacher began his sermon with a ten-minute sales job for the church, I was initially put off. Over and over again he said that he loved this church, that he loved the pastor and the pastor’s family, that he loved Birmingham and the impact the church was having on Birmingham. I began checking my clock. Was this guy ever going to get around to preaching? But then I began to reflect that if people are exposed to this kind of cheerleading on a regular basis, they probably begin believing it. They might even begin acting on it. One of the most powerful tools leaders have to change behavior is called “attribution.” It means that you attribute to someone the qualities you want for them to have, and then they try to live up to your expectations. In one famous psychology experiment, researchers established a target behavior for three classes of fifth graders. The first class was offered a pizza party if they would keep their classroom free of litter. The second class was offered no reward, but the principle would visit the room and say, “Wow, you kids keep your room so tidy. You must like to keep your room clean.” The last class was the control group. Guess which class did the best job at keeping their room tidy? Not the one with the reward incentive, but the one to whom the principle attributed tidiness. It has become popular to ridicule the self-esteem movement in education of the last decade, but it is mostly because both its critics and advocates misunderstand incentives and behavior change. It is well-established that attribution is a powerful tool for changing behavior for both individuals and communities. This is why good-hearted, well-intentioned pastors who whine about people not participating in missions can’t actually guilt people into serving, while gung-ho pastors who incessantly praise their churches succeed. People live up or down to expectations. Junia is a relatively new name to Christian scholarship. Her name appears in Romans 16:7 alongside several other women church leaders, but she is listed as an apostle, one of the original disciples of Jesus and an eyewitness to the resurrection. It shouldn’t be surprising, since the gospels are all pretty explicit that women played an important role in Jesus’ ministry and were the first ones to witness and proclaim the resurrection, but centuries of male prejudice led translators to assume that she was a man, “Junias,” a name so unusual that it doesn’t appear in any other manuscripts of the time (while “Junia” appears over 250 times). The recent scholarship on Junia implies some interesting things about 1) the early church, 2) Christian history, and 3) how we read the Bible today, all of which have been important themes in my own ministry. First, Biblical scholarship and the early church has been important for my own theology. In contrast to many Christians who believe the Bible must be consistent to be true, I revel in the fact that the Bible has many authors, many points of view, and many theological inconsistencies. Like the modern church, it was made up of liberals and conservatives, authoritarians and revolutionaries, mystics as well as logicians. When we read the Bible, we are thrown into a community of believers who do not always agree with each other, much less our own notions of who God is and what God is up to in the world. This is why we have four gospels, two histories of the monarchy, two creation stories, and multiple letters. I think it’s pretty clear that the early church was an egalitarian community that believed Jesus had opened the Kingdom of God to all, and that Jew and Greek, slave and free, male and female were all welcome at the table. But there were also early editors who were not comfortable with women in leadership, or (gasp!) uppity slaves. Second, Christian history has likewise been a story of reformation and counter-reformation, of new movements of people reaching back to earlier traditions and reclaiming forgotten parts of the Bible. Francis of Assisi, Ignatius Loyola, Martin Luther, John Wesley, Mother Theresa, all created movements and changed their world because they reached back around their traditions to older Christian examples and the Bible itself. You can look at this as a big mess of conflicted history, or you can choose to see the power of the Holy Spirit leading people to deeper understanding of what Jesus’ Good News means to their generation or culture. Lastly, when I preach, one of my main goals is to help people hear the Bible with fresh ears. Many of us—believers as well as skeptics—have been trained to miss important ideas in the Bible. I didn’t really fall in love with Jesus until I learned that he had a sense of humor which sometimes tended toward the gutter. People have managed to argue about homosexuality and religious exclusivism without ever recognizing the early church’s belief that God shows no partiality. I don’t want to ever claim that my interpretations of scripture are the only right ones, but I do think I offer people fresh theological options for engaging the Bible and understanding their world in light of it. So for me, Junia speaks to all of those things—she is a link to the early church, a correction for the abuses of Christian history, and an interpretive lens for how we do theology today. She stands for all the forgotten saints at the margins who we reclaim from the past, and she symbolizes hope for a more just future for those who follow Jesus. As I’ve been toying with church names for a church plant in the Birmingham area, Junia has come to mind. There are plenty of Methodist and other churches named after male saints, and there are even a few named for Saint Mary or Saint Elizabeth. But there aren’t any named for Junia. John McClure offers great advice on composing congregational prayers. 3) the genre of prayer that is being offered at a particular moment in public worship (adoration, confession, petition, thanksgiving, intercession, etc.). 4) the theological elements that go into each genre of prayer. Over the course of the next few posts, I will address these questions. Last week I went to see Prometheus in IMAX 3D. For a sci-fi nerd like me, it was worth every penny of the $15 ticket. The most awesome thing about the IMAX theater is not the visuals, in my humble opinion—it is the speakers. You do not hear the bass so much as feel it, and it is so powerful that when Prometheus was landing on the alien planet I could feel the rumble of the engines in my body. I actually worried a bit that the vibrations might be throwing my heart out of rhythm, but I couldn’t remember if that was an urban legend or not. But really, after the first thirty minutes or so of alien landscape flyovers, tiny shots of the ship dwarfed by enormous moons, and gut-scrambling engine noise, I more or less forgot about the special effects. All the noise and glam is pointless unless it enhances a good story, and I got wrapped up the story. I forgot I was watching a movie in 3D. The same thing can happen watching an antique 6-inch black-and-white television screen, if the story is good enough. And all the special effects in the world can’t save a boring film. I was one of the unfortunate people who shelled out money to see The Matrix: Reloaded in the theater, and I found myself checking my watch and thinking about what I would do after the movie during the fight scenes. I think the same thing is true of worship in church. You can put a lot of resources into creating an experience with lighting, fog machines, big screens, gimmicks, and great audio, but they can’t compensate for a lack of substance. And if the story is good enough, people get caught up in the experience and forget where they are, or the limitations of the technology. It is also possible, of course, for technology to sabotage worship. A buzzing microphone or lighting problem will distract people and cause them to drop out of the experience. But these things are easily overcome. Nothing can take the place of a good story, well-told. She went to the basement and returned with an oblong box. 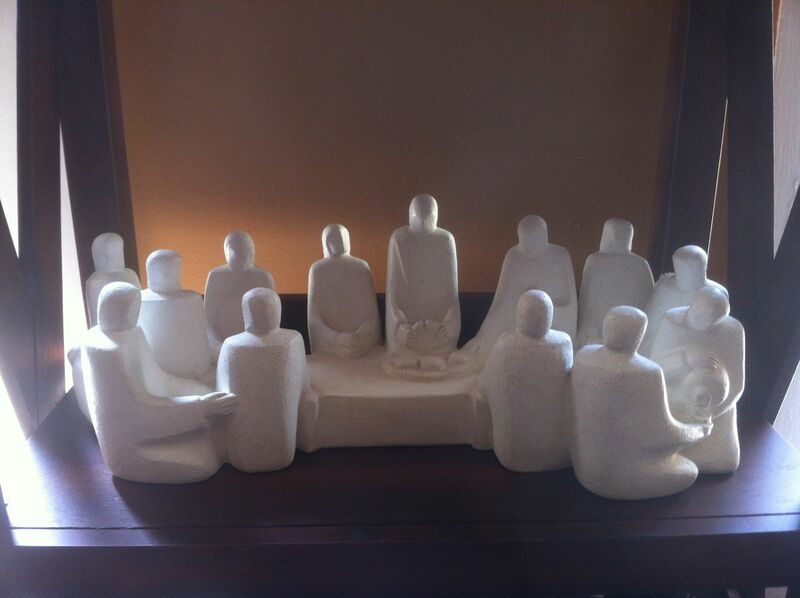 After peeling away the newspaper and bubble wrap inside, she brought out the Last Supper sculpture my parents gave me as a seminary graduating gift. I put it on the top shelf. Something inside me clicked. “NOW it is my office,” I said. There is a period of time after moving when the new space still feels alien, like you are in someone else’s home. Bringing something familiar into the new space helped me make an emotional switch. I sometimes have a tendency to spiritualize things, as though objects and places do not matter. But physical things do matter. We learn and experience the world in primal ways like touch and smell. Physical things communicate meaning. We attach memories and ideas to them, inscribing and arranging our world in a way that helps us navigate it. In the same way that objects made me feel grief at leaving my familiar home, they can comfort, too. Since I’m working from home now, I’ve thought quite a bit about how to teach and remind myself that I’m at work. I cannot, for example, work in my bathrobe. I need to dress and act as though I’m going to work. I was proud that today, my first day “in the office,” I was downstairs by 8:00, journaling, reading the Bible, and making my to-do list. In MY office. As I begin dreaming what our church worship space will be like, I enjoy imagining the kinds of things that will help people feel welcome, that will communicate values and theological meaning. I think about the cultural and counter-cultural ideas we want to teach through touch and smell and sight, using the kinds of primal senses God gave us to experience our world. I would love to learn from others: what kinds of things communicate welcome to you? A sense of sacred space? What physical signs and symbols point you toward spiritual mystery? You either like dark chocolate or you don’t. People who favor milk chocolate like its creamy sweetness. People who favor dark chocolate like sweets that bite back. I like both, but I find that a little dark chocolate goes a long way. That’s what cleaning out my office has been like. The bite snuck up on me Wednesday, while I was putting stuff in boxes. I didn’t feel sad in my brain, because I was busy thinking about all the stuff I had to do for both new church business and my personal life. But my body knew what my brain did not, and my eyes were suddenly full of tears while my brain was busy protesting, “Wait a minute, I’m not sad!” I can recognize grief when it comes. Strange things trigger it: smells especially have a weird way of zapping straight into your limbic system and making you remember things you thought you had forgotten, evoking strong emotions you didn’t know you had. Textures, too, perhaps because they are so physical, can make us react physically. In this case it was the concrete physicality of the things in my drawer: a tin of beeswax, a roll of duct tape, a green Sharpie marker, some scattered paperclips. I have no emotional attachment to them, but they are familiar, and my fingers brush them every time I open my drawer. It is strange, turning away from a familiar life to a life whose contours and rhythms I do not yet know. It’s not so much what needs to be done but how, and where, and the companions I’ll have along the way. It has always been so easy to go down the hall to find one of my awesome colleagues and just chat for a bit when I needed some advice or to talk through an idea, or just for some social interaction because I was lonely. Leaving that behind is hard. Change is hard. But I also have the excitement and anticipation of what’s coming next, and an overwhelming sense of gratitude for all that Trinity has given me over the last six years. I try to count my blessings but they are too many, so all I can do is gesture feebly at them and hope people get the right idea. The whole Hebrew Bible is full of stories of leaving and arriving, of joyful and heartbreaking departures: Abe and Sarah leaving Ur for the Promised Land, or the people of Jerusalem being led away in exile. We don’t get a lot of details about their goodbyes, but we do know that the story of faith is one of meetings and departures, of setting out as well as homecoming. This part is bittersweet, like dark chocolate. I hope that soon I can wash it down with a cold glass of milk.